On August 29, 2005 Hurricane Katrina struck the Gulf Coast -- leaving its mark as one of the strongest storms to ever impact the U.S. coast. 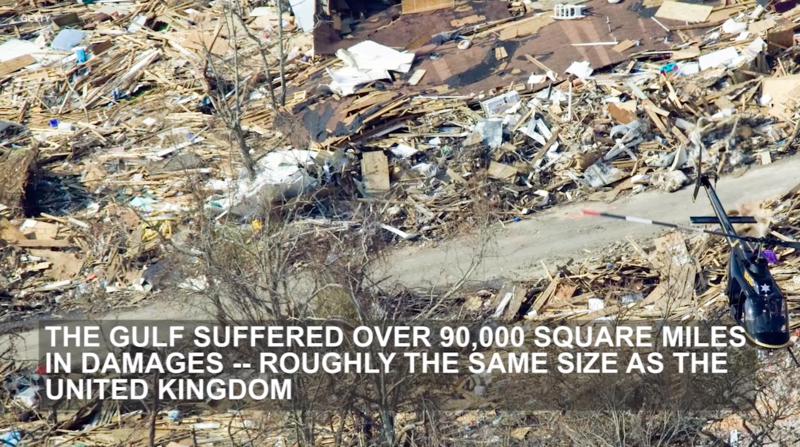 Devastation ranged from Louisiana to Alabama to Mississippi and claimed 1,833 lives. It was the costliest hurricane to ever hit the U.S., causing an estimated $108 billion in damage. The storm was marked as a Category 3, bringing about destructive 125 mph winds.The levees protecting New Orleans failed, and almost 80% of the area was affected by flooding. The Gulf suffered over 90,000 square miles in damages -- which is roughly the size of the United Kingdom. Many sought refuge at the Superdome which was a haven for those who didn't leave the city. The aftermath of the storm was devastating, leaving almost a million people displaced. The National Guard rescued around 34,000 people in New Orleans. Over a decade later, and the area is still recovering from the tragic event. The government rebuilt a stronger levee system and gave over $120 billion dollars toward emergency relief. Since, more than half of New Orleans' 72 neighborhoods affected have recovered over 90% of their population. 11 years later, Hurricane Katrina remains one of most devastating natural disasters in recent U.S. history. Aerial view of massive flooding and destruction caused by Hurricane Katrina September 7, 2005 in New Orleans, LA. Shrimp boats piled up on a bridge blocking the highway almost 60 days after Hurricane Katrina devastated the area October 25, 2005 in Empire, LA. Aerial view of massive flooding and destruction scattering cars in the aftermath of Hurricane Katrina September 2, 2005 in New Orleans, LA. Aerial view of massive flooding and destruction caused by Hurricane Katrina including a broken retaining wall part of a levee September 7, 2005 in New Orleans, LA. View of massive flooding and destruction in the aftermath of Hurricane Katrina September 6, 2005 in New Orleans, LA. FEMA Urban Search & Rescue teams carry and injured elderly man to an evacuation helicopter in the aftermath of Hurricane Katrina September 1, 2005 in New Orleans, LA. Survivors rescued by FEMA urban search and rescue teams in the aftermath of Hurricane Katrina August 31, 2005 in New Orleans, LA. Survivors being evacuated at New Orleans Airport to other states in the aftermath of Hurricane Katrina September 1, 2005 in New Orleans, LA. An elderly couple walk up the ramp to the Superdome after being rescued from their flooded home as the city is evacuated due to hurricane Katrina August 31, 2005 in New Orleans, LA. Survivors rescued by urban search and rescue on an airboat in the aftermath of Hurricane Katrina August 31, 2005 in New Orleans, LA. Residents stand outside the damaged Superdome used as a shelter in the aftermath of Hurricane Katrina September 2, 2005 in New Orleans, LA. Thousands of Hurricane Katrina survivors from New Orleans are relocated to a Red Cross shelter in the Houston Astrodome September 1, 2005 in Houston, TX. Aerial view of massive flooding and breach in levees in the aftermath of Hurricane Katrina August 30, 2005 in New Orleans, LA. FEMA urban search and rescue teams pull a survivors to safety in the aftermath of Hurricane Katrina September 5, 2005 in New Orleans, LA. FEMA urban search and rescue teams search for survivors by boat in the aftermath of Hurricane Katrina September 5, 2005 in New Orleans, LA. FEMA urban search and rescue teams search for survivors by air boat in the aftermath of Hurricane Katrina September 3, 2005 in New Orleans, LA. National Guardsmen using a front-end loader rescues survivors from the floodwater in the aftermath of Hurricane Katrina August 31, 2005 in New Orleans, LA. Hurricane Katrina survivors from New Orleans search the message board for loved ones after being relocated to a Red Cross shelter in the Houston Astrodome September 4, 2005 in Houston, TX. FEMA urban search and rescue teams search for survivors in the aftermath of Hurricane Katrina September 5, 2005 in New Orleans, LA.